The Reluctant Storyteller: What's a birthday without a cake? One of the things I did not stress so much about in my preparation for Lex's birthday was the cake. I really wasn't too particular about it. Sa totoo lang, a simple (and random) Goldilocks or Red Ribbon cake would be fine by me. Or kung medyo pa-special, Estrel's. I was browsing Instagram one day and a picture of a cake caught my eye. I thought to get in touch with the maker just to inquire how much a simple one-layer cake cost and was surprised to know that it's not very expensive at all! It was then I discovered that it's doable to have a cake customized without shelling out too much. Just look at it, who would have thought that cake cost less than three thousand pesos? 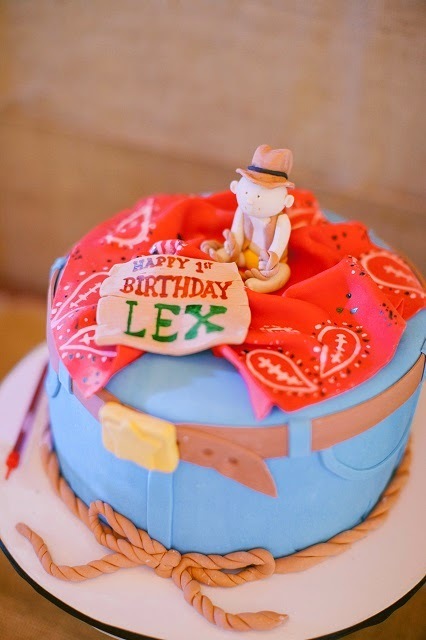 Lex's cake is an 8" round cake created by Michelle Teves of Cococakes. Michelle was actually my schoolmate back in college. She's a few years older than me but I knew her (as does everyone haha!) because of her Pepsi commercial. She's the girl who just moved in next door. The cake was not served to the guests. We forgot to have it sliced! So when we got home, we shared it with our neighbors na lang. The cake is soft, moist, chocolate banana goodness. It tastes too good not to be shared. Literally, half of the cake is gone by the next day. Such a pretty cake. Ako naman cakes are always important for me. Every month may customized cakes si Skye. Pero its from her Ninang. Kaya mura! Madaya!